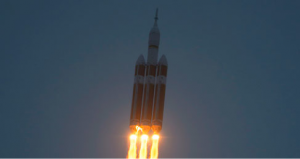 On Friday December 5, 2014, NASA Orion launched atop a Delta IV Heavy rocket from Cape Canaveral on its very first test flight. This is great news because Orion is the first NASA made spacecraft to be launched since the retirement of the space shuttle program in 2011. The Orion spacecraft will take humans farther than they have ever gone before. It will serve as an exploration vehicle that will carry the crew to space, provide emergency abort capability, sustain the crew during the space travel, and provide safe re-entry from deep space return velocities. The Orion spacecraft may be used to send astronauts back to the moon and even set up a lunar colony. There has even been discussion about using the Orion spacecraft to send astronauts to Mars by 2030! For more information on Orion and other exciting space news visit www.nasa.gov.